THE exact period in the history of the apostolic Church at which we have now arrived is a most interesting one. We stand at the very first origin of a new development in Christian life and thought. Let us observe it well, for the whole future of the Church is bound up with it. Christianity was at the beginning simply a sect, of Judaism. It is plain that the Apostles at first thus regarded it. They observed Jewish rites, they joined in the temple and synagogue worship, they restricted salvation and God’s favour to the children of Abraham, and merely added belief in Jesus of Nazareth as the promised Messiah to the common Jewish faith. The spirit of God was indeed speaking through the Apostles, leading them, as it led St. Peter on the day of Pentecost, to speak words with a meaning and scope far beyond their thoughts. They, like the prophets of old, knew not as yet what manner, of things the Spirit which was in them did signify. So thoughts beyond their thought to those high bards were given." Their speech had a grander and wider application than they themselves dreamt of; but the power of prejudice and education was far too great even for the Apostles, and so, though the nobility and profuseness of God’s mercy were revealed and the plenteousness of His grace was announced by St. Peter himself, yet the glory of the Divine gift was still unrecognised. Jerusalem, the Temple, the Old Covenant, Israel after the flesh, -these things as yet bounded and limited the horizon of Christ’s Church. How were the new ideas to gain an entrance? How was the Church to rise to a sense of the magnificence and universality of its mission? Joseph, who by the Apostles was surnamed Barnabas, emerges upon the scene and supplies the answer, proving himself in very deed a son of consolation, because he became the occasion of consoling the masses of mankind with that truest comfort, the peace of God which passes all understanding. Let us see how this came about. I The Christian leaders belonged originally to the extreme party in Judaism. The Jews were at this time divided into two sections. There was the Hebrew party on the one hand; extreme Nationalists as we might call them. They hated everything foreign. They clung to the soil of Palestine, to its language and to its customs. They trained up their children in an abhorrence of Greek civilisation, and could see nothing good in it. This party was very unprogressive, very narrow-minded, and, therefore, unfit to recognise the developments of God’s purposes. The Galileans were very prominent among them. They lived in a provincial district, remote from the influences of the great centres of thought and life, and missed, therefore, the revelations of God’s mind which He is evermore making through the course of His providential dealings with mankind. The Galileans furnished the majority of the earliest Christian leaders, and they were not fitted from their narowness to grasp the Divine intentions with respect to Christianity and its mission. What a lesson for every age do we behold in this intellectual and spiritual defect of the Galileans. They were conscientious, earnest, devout, spiritually-minded men. Christ loved them as such, and devoted Himself to their instruction. But they were one-sided and illiberal. Their very provincialism, which had sheltered them from Sadduceism and unbelief, had filled them with blind prejudices, and as the result had rendered them unable to read aright the mind of God and the development of His purposes. Man, alas! is a very weak creature, and human nature is very narrow. Piety is no guarantee for wisdom and breadth, and strong faith in God’s dealings in the past often hinders men from realising and obeying the Divine guidance and the evolution of His purposes amid the changed circumstances of the present. The Galilean leaders were best fitted to testify with unfaltering zeal to the miracles and resurrection of Christ. They were not best fitted to lead the Church into the possession of the Gentiles. There was another party among the Jews whom God had trained by the guidance of His providence for this purpose. The Acts of the Apostles casts a strong and comforting light back upon the history of the Lord’s dealings with the Jews ever since the days of the Babylonish Captivity. We can see in the story told in the Acts the reason why God permitted the overthrow of Jerusalem by the hands of Nebuchadnezzar, and the apparent defeat for the time of His own designs towards the chosen people. The story of the dispersion is a standing example how wonderfully God evolves good out of seeming ill, making all things work together for the good of His Church. The dispersion prepared a section of the Jews, by travel, by foreign civilisation, by culture, and by that breadth of mind and sympathy which is thereby produced, to be mediators between the Hebrew party with all their narrowness and the masses of the Gentile world whom the strict Jews would fain have shut out from the hope of God’s mercy. This liberal and progressive party is called in the Acts of the Apostles the Hellenists. They were looked at askance by the more old-fashioned Hebrews. They were Jews, children of Abraham indeed, of the genuine stock of Israel. As such they had a true standing-ground within the Jewish fold, and as true Jews could exercise their influence from within much more effectually than if they stood without; for it has been well remarked by a shrewd observer, that every party, religious or political, is much more powerfully affected by movements springing from within than by attacks directed from without. An explosive operates with much more destructive force when acting from within or underneath a fortification than when brought into play from outside. Such was the Hellenistic party. No one could deny their true Jewish character, but they had been liberalised by their heaven-sent contact with foreigners and foreign lands; and hence it is that we discern in the Hellenistic party, and specially in Joseph, who by the Apostles was surnamed Barnabas, the beginnings of the glorious ingathering of the Gentiles, the very first rift in the thick dark cloud of prejudice which as yet kept back even the Apostles themselves from realising the great object of the gospel dispensation. The Hellenists, with their wealth, their culture, their new ideas, their sense and value of Greek thought, were the bridge by which the spiritual life, hitherto wrapped in Jewish swaddling clothes, was to pass over to the masses of the Gentile world. The community of goods led Joseph Barnabas to dedicate his substance to the same noble cause of unselfishness. That dedication led to disputes between Hellenists and Hebrews, and these disputes occasioned the election of the seven deacons, who, in part, at least, belonged to the more liberal section. Among these deacons we find St. Stephen, whose teaching and martyrdom were directly followed by St. Paul and his conversion, and St. Paul was the Apostle of the Gentiles and the vindicator of Christian freedom and Christian liberty. St. Barnabas and his act of self-denial and self-sacrifice in surrendering his landed estate are thus immediately connected with St. Paul by direct historic contact, even if they had not been subsequently associated as joint Apostles and messengers of the Churches in their first missionary journeys; while again the mistaken policy of communism is overruled to the world’s abiding benefit and blessing. How wonderful, indeed, are the Lord’s doings towards the children of men! II We have thus suggested one of the main lines of thought which run through the first half of this book of the Acts. Let us now look a little more particularly at this Joseph Barnabas who was the occasion of this great, this new departure. We learn then, upon consulting the sacred text, that Joseph was a Levite, a man of Cyprus by race; he belonged, that is, to the class among the Jews whose interests were bound up with the maintenance of the existing order of things; and yet he had become a convert to the belief proclaimed by the Apostles. At the same time, while we give full credit to this Levite for his action, we must not imagine that either priests or Levites or Jews at that period fully realised all the consequences of their decisions. We find that men at every age take steps blindly, without thoroughly realising all the results which logically and necessarily flow forth from them. Men in religious, political, social matters are blind and cannot see afar off. It is only step by step that the purposes of God dawn upon them, and Joseph Barnabas, the Levite of Cyprus, was no exception to this universal rule. He was not only a Levite, but a native of Cyprus, for Cyprus was then a great stronghold and resort of the Jewish race. It continued to be a great centre of Jewish influence for long afterwards. In the next century, for instance, a great Jewish rebellion burst forth wherever the Jews were strong enough. They rose in Palestine against the power of the Emperor Hadrian, and under their leader Barcochba vindicated the ancient reputation of the nation for desperate and daring courage; while, in sympathy with their brethren on the mainland, the Jews in Cyprus seized their arms and massacred a vast multitude of the Greek and Roman settlers, numbering, it is said, two hundred and forty thousand persons. The concourse of Jews to Cyprus in the time of the Apostles is easily explained. Augustus Caesar was a great friend and patron of Herod the Great, and he leased the great copper mines of the island to that Herod, exacting a royalty upon their produce as we learn from Josephus, the well-known Jewish historian (‘Antiqq., 16. 4:5). It was only to be expected, then, that when a Jewish monarch was leasehoulder and manager of the great mining industry of the island, his Jewish subjects should flock thither, and it was very natural that amongst the crowds who sought Cyprus there should be found a minister of the Jewish faith whose tribal descent as a Levite reminded them of Palestine, and of the City of God, and of the Temple of Jehovah, and of its solemn, stately worship.102 This residence of Barnabas in Cyprus accounts for his landed property, which he had the right to sell just as he liked. A Levite in Palestine could not, according to the law of Moses when strictly construed, possess any private landed estate save in a Levitical city. Meyer, a German commentator of great reputation, has indeed suggested that Jer 32:7, where Jeremiah is asked to redeem his cousin’s field in the suburbs of Anathoth, proves that a member of the tribe of Levi could possess landed estate in Palestine. He therefore concludes that the old explanation that the landed property of Barnabas was in Cyprus, not in Palestine, could not stand. But the simple fact is that even the cleverest German expositors are not familiar with the text of their Bibles, for had Meyer been thus familiar he would have remembered that Anathoth was a city belonging to the priests and the tribe of Levi, and that the circumstance of Jeremiah the priest possessing a right to landed property in Anathoth was no proof whatsoever that he could hold landed property anywhere else, and, above all, affords no ground for the conclusion that he could dispose of it in the absolute style which Barnabas here displayed.103 We conclude then that the action of Barnabas on this occasion dealt with his landed estate in Cyprus, the country where he was born, where he was well-known, and where his memory is even still cherished on account of the work he there performed in conjunction with St. Paul. III Let us see what else we can glean concerning this person thus prominent in the early Church, first for his generosity, and then for his missionary character and success. It is indeed one of the most fruitful and interesting lines upon which Bible study can be pursued thus to trace the scattered features of the less known and less prominent characters of Scripture, and see wherein God’s grace specially abounded in them. The very personal appearance of Barnabas can be recalled by the careful student of this book.104 Though it lies a little out of our way, we shall note the circumstance, as it will help us to form a more lively image of Barnabas, the Son of Consolation. The two Apostles, Paul and Barnabas, were on their first missionary tour when they came to the city of Lystra in Lycaonia. There the multitude, astonished at the miracle wrought upon the cripple by St. Paul, attempted to pay. divine honours to the two Christian missionaries. "They called Barnabas Jupiter, and Paul Mercurius, because he was the chief speaker." It must have been their physical characteristics as well as the mode of address used by the Apostles which led to these names; and from the extant records of antiquity we know that Jupiter was always depicted as a man with a fine commanding presence, while Mercury, the god of eloquent speech, was a more insignificant figure. Jupiter, therefore, struck the Lycaonian people as the fittest name for the taller and more imposing-looking Apostle, while St. Paul, who was in bodily presence contemptible, was designated by the name of the active and restless Mercury. His character again shines through every recorded action of St. Barnabas. He was a thoroughly sympathetic man, and, like all such characters, he was ever swept along by the prevailing wave of thought or action, without allowing that supreme place to the judgment and the natural powers which they should always hold if the feelings and sympathies are not to land us in positions involving dire ruin and loss. He was carried away by the enthusiasm for Christian communism which now seized upon the Jerusalem Church. He was influenced by the Judaising movement at Antioch, so that "even Barnabas was carried away with the Petrine dissimulation." His sympathies got the better of his judgment in the matter of St. Mark’s conduct in abandoning the ministry to which St. Paul had called him. His heart was stronger, in fact, than his head. And yet this very weakness qualified him to be the Son of Consolation. A question has, indeed, been raised, whether he should be called the Son of Consolation or the Son of Exhortation, but practically, there is no difference. His consolations were administered through his exhortations. His speech and his advice were of a consoling, healing, comforting kind. There are still such men to be found in the Church. Just as all other apostolic graces and characteristics are still manifested, -the eloquence of a Paul, the courage of a Peter, the speculative flights of a John, —	so the sympathetic power of Barnabas is granted to some. And a very precious gift it is. There are some good men whose very tone of voice and bodily attitudes—their heads thrown back and their arms akimbo and their aggressive walk—at once provoke opposition. They are pugnacious Christians, ever on the lookout for some topic of blame and controversy. There are others, like this Barnabas, whose voices bring consolation, and whose words, even when not the clearest or the most practical, speak counsels of peace, and come to us thick-laden with the blessed dews of charity. Their advice, is not, indeed, always the wisest. Their ardent cry is always, Peace, peace. Such a man on the political stage was the celebrated Lucius Carey, Lord Falkland, in the days of the great civil war, who, though he adhered to the royalist cause, seemed, as the historian tells us, to have utterly lost all heart once that active hostilities commenced. Men of this type appear in times of great religious strife. Erasmus, for instance, at the time of the Reformation, possessed a good deal of this spirit which is devoted to compromise, and ever inclined to place the interests of peace and charity above those of truth; and principle, just as Barnabas would have done at Antioch were it not for the protest of his stronger and sterner friend St. Paul. And yet such men, with their sympathetic hearts and speech, have their own great use, infusing a healing, consoling tone into seasons of strife, when others are only too apt to lose sight of the sweet image of Christian love in pursuit of what they consider the supreme interests of religious or political truth. Such a man was Barnabas all his life, and such we behold him on his first visible entrance upon the stage of Church history, when his sympathies and his generosity led him to consecrate his independent property in Cyprus to his brethren’s support, and to bring the money and lay it down at the Apostles’ feet. IV Now for the contrast drawn for us by the inspired pen of St. Luke, a contrast we find oft repeating itself in Church history. Here we have the generous, sympathetic Son of Consolation on the one side, and here, too, we have a warning and a type for all time that the tares must evermore be mingled with the wheat, the false with the true, the hypocrites with real servants of God, even until the final separation. The accidental division of the book into chapters hinders casual readers from noticing that the action of Ananias and his wife is set by the writer over against that of Barnabas. Barnabas sold his estate and brought the price, the whole price, and surrendered it as an offering to the Church. The spirit of enthusiastic giving was abroad, and had seized upon the community; and Barnabas sympathised with it. Ananias and Sapphira were carried away too, but their spirits were meaner. They desired to have all the credit the Church would give them for acting as generously as Barnabas did, and yet, while getting credit for unselfish and unstinting liberality, to be able to enjoy in private somewhat of that which they were believed to have surrendered. And their calculations were terribly disappointed. They tried to play the hypocrite’s part on most dangerous ground just when the Divine Spirit of purity, sincerity, and truth had been abundantly poured out, and when the spirit of deceit and hypocrisy was therefore at once recognised. It was with the Apostles and their spiritual natures then as it is with ourselves and our physical natures still. When we are living in a crowded city we notice not strange scents and ill odours and foul gases: our senses are dulled, and our perceptive powers are rendered obtuse because the whole atmosphere is a tainted one. But when we dwell in the pure. air of the country, and the glorious breezes from mountain and moor blow round us fresh and free, then we detect at once, and at a long distance, the slightest ill-odour or the least trace of offensive gas. The outpoured presence of the Spirit, and the abounding love which was produced thereby, quickened the perception of St. Peter. He recognised the hypocrisy, characterised the sin of Ananias as a lie against the Holy Ghost; and then the Spirit and Giver of life, seconding and supporting the words of St. Peter, withdrew His support from the human frame of the sinner, and Ananias ceased to live, just as Sapphira, his partner in deceit, ceased to live a few hours later. The deaths of Ananias and Sapphira have been ofttimes the subject of much criticism and objection, on the part of persons who do not realise the awfulness of their position, the full depths of their hypocrisy, and the importance of the lesson taught by their punishment to the Church of every age. Their position was a specially awful one, for they were brought into closest contact, as no Christian can now be brought, with the powers of the world to come. The Spirit was vouchsafed during those earliest days of the Church in a manner and style which we hear nothing of during the later years of the Apostles. He proved His presence by physical manifestations, as when the whole house was shaken where the Apostles were assembled; a phenomenon of which we read nothing in the latter portion of the Acts. By the gift of tongues, by miracles of healing, by abounding spiritual life and discernment, by physical manifestations, the most careless and thoughtless in the Christian community were compelled to feel that a supernatural power was present in their midst and specially resting upon the Apostles. Yet it was into such an atmosphere that the spirit of hypocrisy and of covetousness, the two vices to which Christianity was specially opposed, and which the great Master had specially denounced, obtruded itself as Satan gained entrance into Eden, to defile with their foul presence the chosen dwelling-place of the Holy Ghost. The Holy Ghost vindicated His authority therefore, because, as it must be observed, it was not St. Peter sentenced Ananias to death. No one may have been more surprised than St. Peter himself at the consequences which followed his stern rebuke. St. Peter merely declared his sin, "Thou hast not lied unto men, but unto God"; and then it is expressly said, "Ananias hearing these words fell down, and gave up the ghost." It was a stern action indeed; but then all God’s judgments have a stern side. Ananias and Sapphira were cut off in their sins, but men are every day summoned into eternity in precisely the same state and the same way, and the only difference is that in the case of Ananias we see the sin which provoked the punishment and then we see the punishment immediately following. Men object to this narrative simply because they have a one-sided conception of Christianity such as this period of the world’s history delights in. They would make it a religion of pure, unmitigated love; they would eliminate from it every trace of sternness, and would thus leave it a poor, weak, flabby thing, without backbone or earnestness, and utterly unlike all other dispensations of the Lord, which have their stern sides and aspects as well as their loving. It may well have been that this incident was inserted in this typical church history to correct a false idea which would otherwise have grown up. The Jews were quite well accustomed to regard the Almighty as a God of judgment as well as a God of love. Perhaps we might even say that they viewed Him more in the former light than in the latter. Our Lord was obliged, in fact, to direct some of His most searching discourses to rebuke this very tendency. The Galileans, whose blood Pilate mingled with their sacrifices, the men upon whom the tower of Siloam fell—neither party were sinners above all that were at Jerusalem, or were punished as such. Such was His teaching in opposition to the popular idea. The Apostles were once quite ready to ascribe the infirmity of the man born blind to the direct judgment of the Almighty upon himself or upon his parents. But men are apt to rush from one extreme to another. The Apostles and their followers were now realising their freedom in the Spirit; and some were inclined to run into licentiousness as the result of that same freedom. They were realising, too, their relationship to God as one of pure filial love, and they were in great danger of forgetting that God was a God of justice and judgment as well, till this stern dispensation recalled them to a sense of the fact that eternal love is also eternal purity and eternal truth, and will by no means clear the guilty. This is a lesson very necessary for every age of the Church. Men are always inclined, and never, perhaps, so much as at the present time, to look away from the severe side of religion, or even to deny that religion can have a severe side at all. This tendency in religious matters is indeed simply an exhibition of the spirit of the age. It is a time of great material prosperity and comfort, when pain is regarded as the greatest possible evil, softness, ease, and enjoyment the greatest possible good. Men shrink from the infliction of pain even upon the greatest criminals; and this spirit infects their religion, which they would fain turn into a mere matter of weakly sentiment. Against such a notion the judicial action of the Holy Ghost in this. case raises an eternal protest, warning the Church against one-sided and partial views of truth, and bidding her never to lower her standard at the world’s call. Men may ignore the fact that God has His severe aspect and His stern dispensations in nature, but yet the fact remains. And as it is in nature so is it in grace: God is. merciful and loving to the penitent, but towards the hypocritical and covetous He is a stern judge, as the punishment of Ananias and Sapphira proved. V This seems one of the great permanent lessons for the Church of every age which this passage embodies, but it is not the only one. There are many others, and they most important. 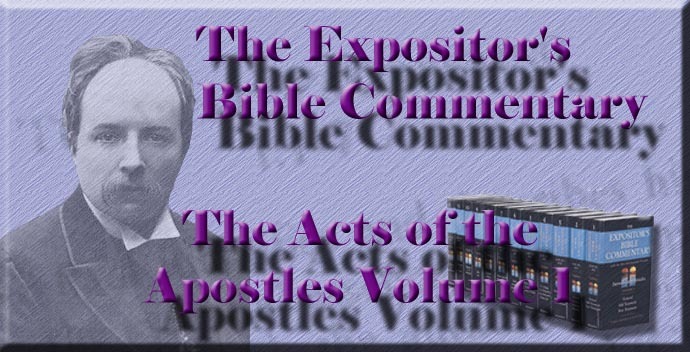 An eminent modern commentator and expositor105 has drawn out at great length, and with many modern applications and illustrations, four great lessons which may be derived from this transaction. We shall just note them, giving a brief analysis of each. (1) There is such a thing as acting as well as telling a falsehood. Ananias did not say that the money he brought was the whole price of his land; he simply allowed men to draw this conclusion for themselves, suggesting merely by his conduct that he was doing exactly the same as Barnabas. There was no science of casuistry in the apostolic Church, teaching how near to the borders of a lie a man may go without actually being guilty of lying. The lie of Ananias was a spiritual act, a piece of deception attempted in the abyss of the human soul, and perpetrated, or attempted rather, upon the Holy Spirit. How often men lie after the same example. They do not speak a lie, but they act a lie, throwing dust into the eyes of others as to their real motives and objects, as Ananias did here. He sold his estate, brought the money to the Apostles, and would fain have got the character of a man of extraordinary liberality and unselfishness, just like others who truly sacrificed their all, while he enjoyed in private the portion which he had kept back. Ananias wished to make the best of both worlds, and failed in his object. He sought to obtain a great reputation among men, but had no regard to the secret eye and judgment of the Almighty. Alas! how many of our actions, how much of our piety and of our almsgiving are tainted by precisely the same vice. Our good. works are done with a view to man’s approbation, and not as in the sight of the Eternal God. (2) What an illustration we find in this passage of the saying of the Apostle, "The love of money is the root of all evil; which while some coveted after, they have erred from the faith, and pierced themselves with many sorrows!" The other scriptures are full of warnings against this vice of covetousness; and so this typical history does not leave the Church without an illustration of its power and danger. Surely if at a time when the supernatural forces of the unseen life were specially manifested, this vice intruded into the special sphere of their influence, the Church of every age should be on its perpetual guard against this spirit of covetousness which the Bible characterises as idolatry. We cannot be as they." Who have the key of Heaven." (4) Lastly, let us learn from this history how to cast out the fear of one another by the greater and more awful fear of God. The fear of man is a good thing in a degree. We should have respect to the opinion of our fellows, and strive to win it in a legitimate way. But Ananias and his consort desired the good opinion of the Christian community regardless of the approval or the watchful eye of the Supreme Judge, who interposed to teach His people by an awful example that in the new dispensation of Love, as well as in the old dispensation of Law, the fear of the Lord is the beginning of wisdom, and that they and they alone have a good understanding who order their lives according to that fear, whether in their secret thoughts or in their public actions. Philo was a contemporary of the Apostles. He has left us many works dealing with this period. He speaks of the Jews of Cyprus in the account of his embassy to the Emperor Caius Caligula. See Milman's History of Jews , iii., 111, 112, and Conybeare and Howson's Life of St. Paul , chap. v.
 See Lightfoot's Horæ Heb. , Acts iv. 36; cf. Josh. xxi. 18. The early history of Barnabas is thus described by Metaphrastes, an ancient Greek writer. Barnabas was born in Cyprus, of rich parents, who sent him to be trained at Jerusalem under Gamaliel. There he formed an early friendship with St. Paul. He was a witness of our Lord's miracles, and was converted by the healing of the impotent man at Bethesda. He then was the means of converting his sister Mary and her son Mark, who was the young man with the pitcher of water whom our Lord commanded His disciples to follow when He was sending them to prepare the Passover. Mary's house was the place where the upper room was situated, and continued to be the meeting-place of the Christians, as we find from Acts xii.Metaphrastes had formerly a very bad reputation as regards truthfulness, but modern investigation has shown that his Lives contain some very ancient documents, going back to the second century at least. See Bishop Lightfoot's address to the Carlisle Church Congress in Expositor 1885, vol. i., p. 3; Prof. Ramsay in Expositor 1889, vol. ix., p. 265 and refs., and Cave's Lives of the Primitive Fathers , p. 35. C. J. Vaughan, D.D., The Church of the First Days , pp. 105-12.